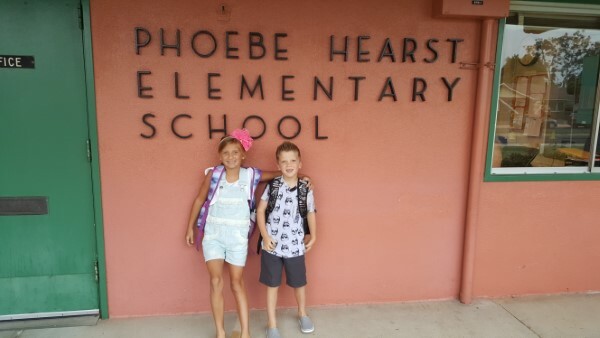 It is official, all the kids in our house are now school kids! And, they are all so excited about this milestone in their lives. So many firsts! Enzo is now a kindergartner (of course, I made his first day of school shirt)! 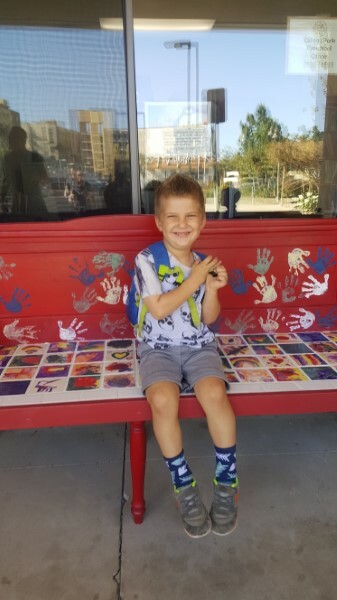 We had an orientation the Friday before school started, so Enzo could meet his teacher and see his classroom and ask any questions he might have. That helped him so much for gaining confidence on that first day. 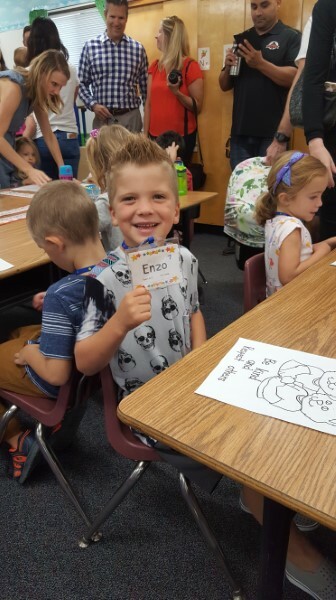 On day one, Enzo walked onto campus ready to be a school kid. He absolutely loves his teacher, enjoys the school routine, and every day that I pick him up, he is smiling so excitedly. 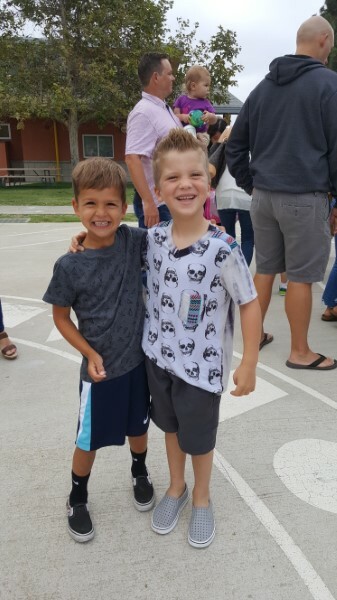 Enzo has quite a few friends in his class that he knew before starting, which is also nice and much different than when Eva knew just one kid in the whole school when she started. And, he is quickly making lots of new friends. I've also noticed several little girls go out of their way to say good morning to him and give him hugs, which he shyly accepts. 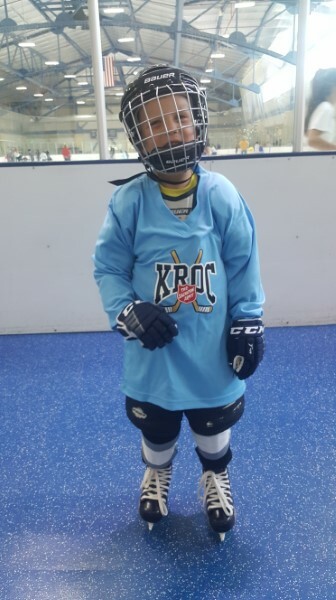 On top of the school routine, Enzo is also playing hockey and soccer. 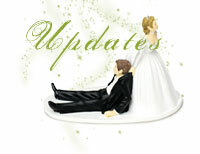 It's been a little nutty over the last couple weeks, but come next week, we'll be winding down a little. In the meantime, though, we enjoy the nice, cool indoor rink after a hot day of running around at school. 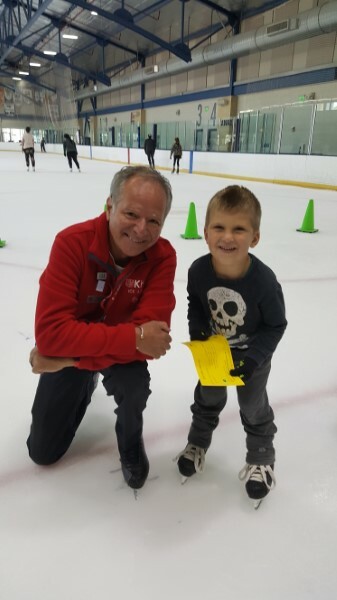 Enzo is mastering ice skating, learning how to dribble the puck well, and desperately wants to nail down the hockey stop. 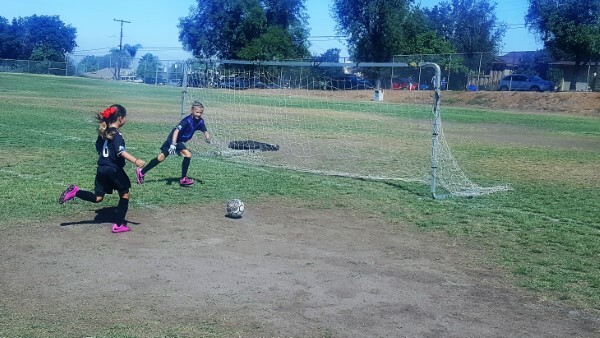 In soccer, Enzo has become much more competitive and isn't scared of getting the ball to attempt a pass or score! Eva, too, is playing soccer and ice skating (she's figure skating). This year she is much more excited and competitive than years past for soccer. 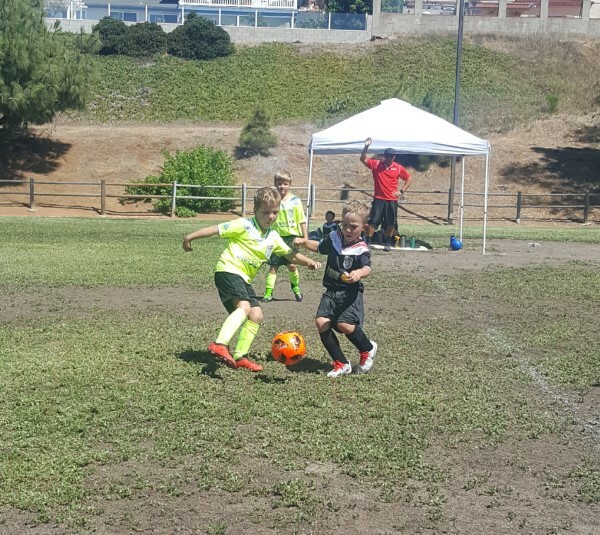 She has grown very interested in the goalie position, which she got to play for the whole first half of her teams first game! 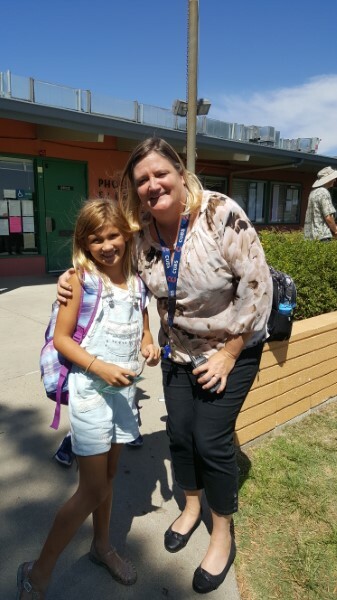 After the school day ended, I got to meet her teacher, who seems to be a great fit for her. 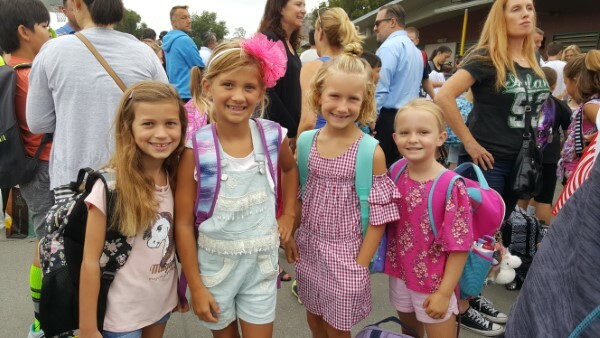 Her teacher is all about community, learning and growing from mistakes, and helping you believe you are awesome! Plus, she has a classroom pet guinea pig that all of the kids can take turns taking home for the weekend. While the big kids were off to school, Zander had a couple weeks home with me before he got to join in the school conversation. It was fun having him around because he had the chance to explore without anyone deciding that he was right or wrong or touching something he shouldn't. He was free to use his entire imagination. It really cracked me up, because he came up with the most interesting things to talk about. 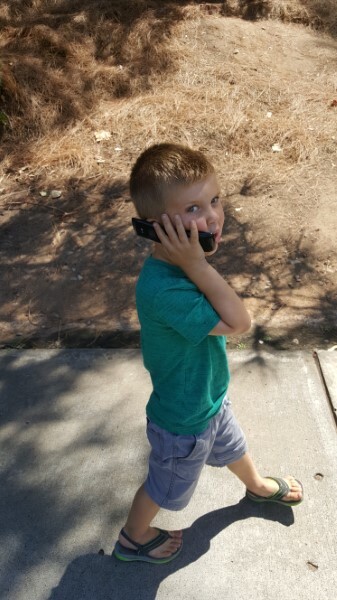 He, very seriously, talked on his flip phone to his imaginary friends, Tico and Jordan. Then, would call his favorite girl, Ashley. One of the most memorable conversations I heard him have was, "Yeah, yeah. Well, I need to change the underwear of the baby I have in my belly. Her name is Pikachu and I'm going to turn her into a worker. Yeah, I'm working right now." This last Monday was his very first day of school (and proudly wearing his mommy made t-shirt, matching Enzo's). He could not wait to get to school, see his teachers, and start making some friends of his own. 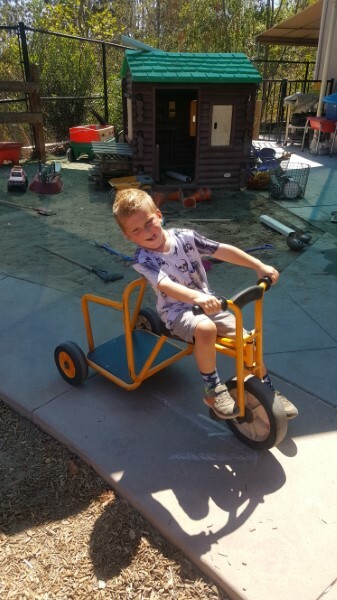 Zander is in the Bees class and has Miss Torres and Miss Judy, which was the same teachers and class name that Enzo had last year. It's nice because the teachers and I already know each other well and Zander is very comfortable around their familiar faces. He is also familar with the school as a whole, for he has spent many days at drop offs and pick ups since he's been born. He was really happy that now he was the one that got to play with all the fun things they have. When I picked him up, he was giving a friend a ride of the back of this big bike that he was driving laps with. Zander is also playing his first year of soccer. 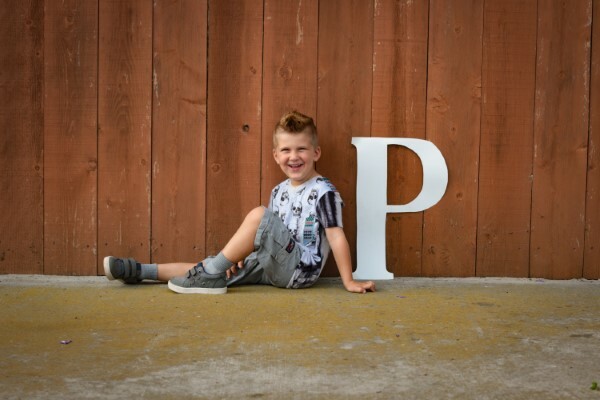 He likes being important and having a soccer team of his own, his coach understands "monster" language and he has a couple boys on the team that he's becoming friends with. 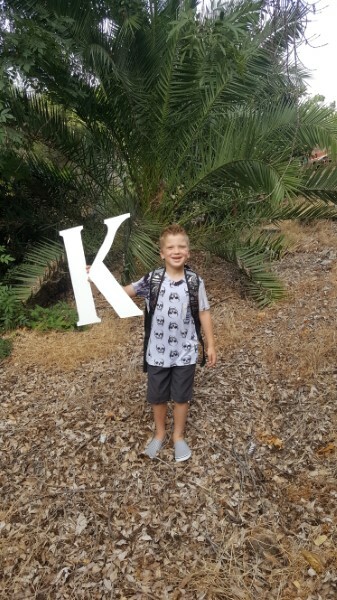 He is one happy kid! We are so proud of these kids for all that they do!